Port Blair: The cultivation of cut flowers under protected condition is gaining importance in Andaman & Nicobar Islands, especially among young entrepreneurs. Realising the potential of the commercial floriculture, especially the cut flower sector, in the Islands, ICAR-CIARI, Port Blair and ICAR-Directorate of Floricultural Research (ICAR-DFR),Pune jointly introduced the popular gladiolus varieties to farmers for large scale cultivation and enhancing farmer’s income. During this, a field day on “Marigold and Gladiolus cultivation for livelihood security in Andaman and Nicobar Islands” was carried out on December 5, 2018 at the farmer’s field at New Bimblitan. The programme was attended by about 32 farmers from nearby villages of South Andaman. 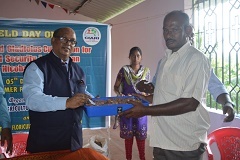 ICAR- Directorate of Floricultural Research, Pune air-lifted the corms of three varieties of gladiolus namely Yellow Shine, Chandani and Punjab Dawn and distributed them to the farmers. Arulandu, a progressive farmer from New Bimblitan was also present during the occasion. It is expected that the collective initiative of two ICAR institutes would go a long way in revolutionizing the commercial cultivation of cut flowers like gladiolus so as to make Andaman and Nicobar Islands self-sufficient in cut flower production. Availability of quality planting material of loose flowers and other ornamentals are necessary for the growth of floriculture in the island. As most of the infrastructure facilities like cool rooms, refrigerated transport trucks, etc. are beyond individual investment of cultivators, hence, these facilities should be created on community basis and should be made available on custom hiring. Possibility of starting joint ventures under public private partnership mode. Efforts also should be made for popularizing indigenous flowers of the Island to various markets in the mainland. The promotion of nursery industry in the Island will enhance rapid growth of floriculture.